Buy Suma Organic Dried Butter Beans 500 grams in the UK from our online shop or directly from our independent Scottish store. Butter beans are delicious in soups, salads and with vegetables and stews. Fresh tomatoes are not in season in January, but you can use canned tomatoes. Go for organic ones if you can, because they have been sprayed a lot less. This recipe contains 125g dried butter beans. This recipe contains 150g dried butter beans. Another warming soup. Soups are great meals if you serve them with some (rye) bread spread with almond butter, butter, margarine or cheese. This recipe contains 100g dried butter beans (soaked overnight and cooked for 1 ½.
Tasty way to use your (homemade) sauerkraut. Sauerkraut has lots of health benefits, besides that it's also virtually fat free. This recipe contains OR 300g dried beans, soaked and cooked for 1 ¼ hours). Where can you buy real Butter Beans - Organic safely online? 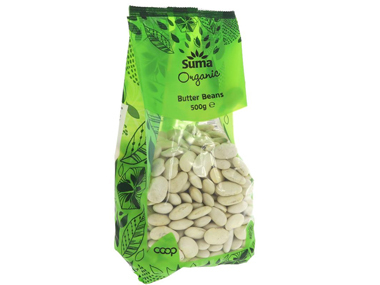 If you are wondering where you can buy Suma Organic Dried Butter Beans 500 grams safely online in the UK, then shop with us. Butter Beans - Organic - Suma Organic Dried Butter Beans 500 grams in Beans & Pulses and Foods.